Memphis Police Address Gas Station Crime Trend; Can Victims Seek Justice, Compensation? Unfortunately, these thieves often take more than money and property. A store clerk was shot and critically injured during a Memphis gas station robbery in July 2018, per WREG reports. 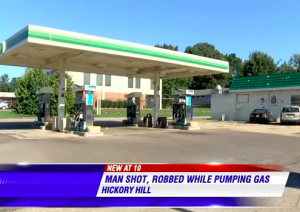 A 26-year-old man was shot and critically injured during an attempted carjacking outside a “gas station” in Hickory Hill in July 2015, per WMC 5 reports. Don’t keep your valuables in your car. Don’t leave keys in the ignition. Make sure your doors are locked. Use a towel the same color as your car’s interior to hide belongings if you must keep them in your car. Tennessee gas station patrons have a right to feel safe and secure while on the premises of the establishment they are visiting. By law, business owners are required to protect all patrons legally on the premises from any foreseeable harm. For example, should a gas station owner have knowledge of prior violence on or near property, they have a responsibility to implement additional security precautions to protect patrons and deter such crime. Additional security measures may include bright lighting, a security guard or off-duty police officer, surveillance cameras, and bulletproof pass-through windows for cash transactions. Should a gas station owner or manager fail in this critical responsibility, they may be held civilly liable for any injuries or wrongful deaths which occur as a consequence. Can I Afford an Attorney? Our Clients frequently come in concerned that they won’t be able to afford legal help. We believe everyone has a right to exceptional legal service. We represent our Clients on a contingency agreement, which generally means that no fees or payments are owed until and unless we recover. This means our interests are always tied to that of our Clients. Be sure to ask any potential personal injury attorney about their fee schedule and whether they represent Clientele on a contingency basis before signing a contract. You Deserve Justice. We Can Help. The Murray Law Firm has an extensive and successful record representing victims and families of negligent gas station security. We have recovered millions of dollars for our Clients, and we offer our legal assistance, if desired. Anyone seeking further information or legal representation is encouraged to contact us via e-mail (click here) or by telephone at 888.842.1616. Consultations are free and confidential.